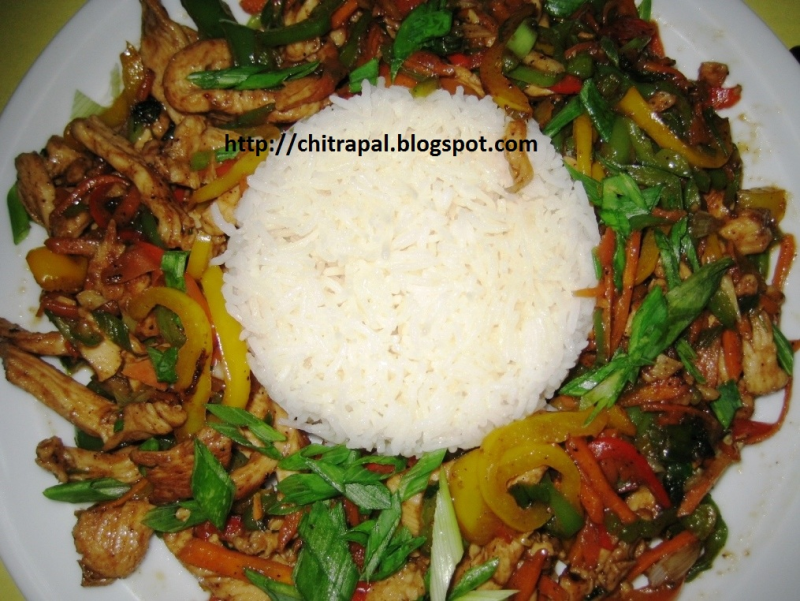 This Spicy chicken and Bell peppers recipe wil make you crave for more. 2 tsp of (mild one) curry powder or use mixture of 2 tsp turmeric powder, red chili powder, garam masala powder, cumin powder, and coriander powder. Heat the Oil in non stick pan and add 1 tbsp of olive oil and 3 tbsp of butter. This will prevent butter to burn. Add the chopped onions, garlic and chili when the oil and butter is hot. Fry till the onions turn golden brown but do not burn. Now add curry powder and stir. Now add tomato puree and salt to taste and let it cook for 1 minute. Add the chopped chicken to the pan, and cook for 4-5 minutes till chicken is almost cooked. Be careful it does not stick to the pan. Now add water to the pan and turn down the heat. Put the lid on and let the chicken cook for 3-4 minutes. Now add bell peppers and stir in and close the lid again and let it cook until bell peppers turn little soft. Now add grated ginger and turn off the gas. Close the lid and set it to other side. In the mean while add 2 tbsp of butter in another non stick pan on low heat. When the butter turns liquid and little hot add the boiled basmati rice without water. Turn off the gas and remove from heat and stir with fork so that rice does not break. Transfer the rice into bowl and push it down. Now tilt the bowl carefully in the middle of tray and spread the cooked chicken jalfrezi around the rice and serve hot. Garnish with spring onions chopped. Hello, I just wanted to say thanks for the recipe. It's a great tasting food recipe and takes little time to cook. However, I had one problem when I was cooking it. I put 1 1/2 cup of water as mentioned and it turned out to be a lot of water and I had to keep it on the stove for a little longer. Also, I didn't see any water in your dish. How'd you do it? Again, it's a great recipe and I can imagine that you're a great cook from your recipes. Thanks once again! Very easy recipe Chitra, good for weekend dinner.